While not being strictly true to the way in which the real material would be used, this faux marbling paint effect links seamlessly with the use of the real material on top of the units and bath. A useful technique for unifying small areas and introducing marble on what would be technically challenging features. The real marble used is Blue Macauba, a successful rendition by the specialist decorator requires that the paint effect be applied to first class preparation of the substrate. 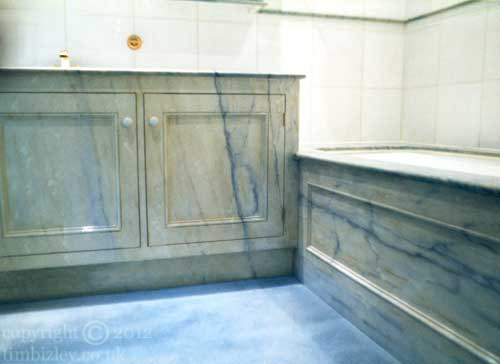 For quality faux marbling this can sometimes involve the final preparation coats be applied by the specialist decorator so that the subsequent varnish coats can lay out flat on the treated surfaces.